Sony announces new HT-RT5 soundbar system with wireless rear speakers | What Hi-Fi? 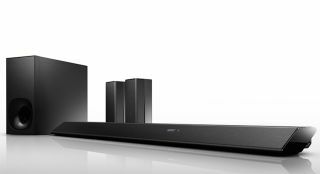 Sony's latest addition to its soundbar family features wireless rear speakers and multi-room functionality, courtesy of the company's SongPal Link technology. We've already reported on a number of new entry-level soundbars from Sony for 2015, but at £600 the HT-RT5 is more of a premium proposition. In total, it's a six channel set-up with a claimed 550W output. The system offes a choice of sound modes, including 'Football Mode' which Sony claims to capture the acoustics for the Morumbi Stadium in Brazil, '9.1ch Cinema Studio' which "transports you to the famous Carey Grant Thatre at Sony Picture Studio in LA", and 'Digital Music Arena' which supposedly recreates the acoustics of London's O2 Arena. The main soundbar unit features a dedicated centre channel and has the option of being wall mounted. The wireless rear speakers and separate subwoofer connnect automatically and you can carry out automatic set-up using the supplied mic and Sony's Digital Cinema Auto Calibration DX software. The HT-RT5 supports Dolby TrueHD and DTS-HD Master Audio from Blu-ray discs, while the soundbar also extends its audio support to high-res music files, including DSD, ALAC, FLAC an WAV variants. There are three HDMI inputs for connecting a high-def Blu-ray player or set-top box, while the bar also features full 4K pass through thanks to its HDCP2.2 compatibility. On the streaming front, the new Sony supports Spotify Connect and Google Cast out of the box so you can beam content from from your smartphone or tablet direct to the soundbar. The HT-RT5 is also compatible with Sony's LDAC audio transmission codec, which Sony claims is upt to three times more efficient at transmitting audio than standard Bluetooth. You can use this feature as long as you have a compatible source, such as the new Sony Xperia Z3+. Multi-room is a key feature for Sony in 2015, and the company's SongPal Link tech allows you to partner the HT-RT5 with other products from the Sony stable, such as the STR-DN860 AV receiver, and play music around the home through the dedicated SongPal app for iOS and Android devices. The HT-RT5 will be available to pre-order from 24th July.